Njini is a venture backed start-up that provides command and control software to manage file data across the enterprise. Their software provides a flexible set of file services and file virtualization capabilities to dramatically reduce the cost of storage, significantly enhance data security and compliance and provide unprecedented visibility to better manage and control a customer’s data estate. This enables customers to derive far greater value at far less cost from their investment in network storage. Riverbed Technology is the IT infrastructure performance company. The Riverbed family of wide area network (WAN) optimization solutions liberates businesses from common IT constraints by increasing application performance, enabling consolidation, and providing enterprise-wide network and application visibility – all while eliminating the need to increase bandwidth, storage or servers. Thousands of companies with distributed operations use Riverbed to make their IT infrastructure faster, less expensive and more responsive. Additional information about Riverbed (NASDAQ: RVBD) is available at http://www.riverbed.com. SASI was aware of Njini through our storage market research and coverage of file area networking. Njini was at an inflection point and a Njini investor introduced SASI to the CEO of Njini. 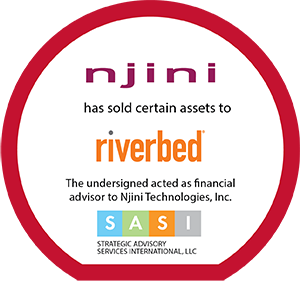 SASI identified, selected and approached a strategic set of acquirers who could leverage Njini’s core solution set. Communicating the core value proposition, larger vision and possible end states for storage management were critical to moving the process forward.